If the holiday season is a time for giving not receiving then the bowl season is a time for offense and not defense. Most teams have more than a month off between their regular-season finale and their bowl game. Sometimes the defenses decide to take even longer off. Bowl games have traditionally been known as offensive showcases. Offensive coordinators pull out all the gadgets and most games, outside of the Humanitarian Bowl in Boise, are generally played in domes or pristine conditions in California and Florida. Whoever said defense wins championships must be predicting a tie in the BCS National Championship Game between Auburn and Oregon. Both teams reached Glendale, Arizona, on the strength of their offense. 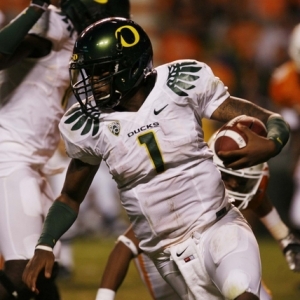 Oregon has the top-ranked unit in the country while Auburn’s is ranked sixth. The total is an almost-hard-to-believe 74 points, the highest of bowl season. This year, offense will win a championship, at least according to the college football bowl game odds. Of the 35 bowl games, 27 of them have a total higher than 50. Eight bowl games have a total higher than 60. How about the lineup of bowl games on Dec. 29? The day starts with the Military Bowl (East Carolina vs. Maryland, total 68), continues with the Texas Bowl (Illinois vs. Baylor, total 63) and concludes with the Alamo Bowl (Arizona vs. Oklahoma State, total 65.5). While the offense we see this bowl season could break all kinds of records, it’s not entirely new. Come late December and early January the offenses dominate bowl season -- that much is certain. However, obviously the oddsmakers are on top of things. The last two seasons combined, 46 of 68 bowl games had a total over 50 points. The ‘under’ has enjoyed tremendous success the last two bowl seasons. In 2008-09 the ‘under’ was 21-13 and last season it was 19-15. Even with potent offenses colliding in many matchups, teams are often seeing totals this high for the first time all season. Oregon has had the nation’s best offense all season but it has never seen a total as high as 74, and only twice has the total crossed 70. Auburn has played 13 games and none have had a total higher than 70, with the highest coming in at 66. The same applies for most other teams. In the Hawaii Bowl between Tulsa and Hawaii the total is 73. That represents the second-highest total for each team this season. Considering the offenses have been off for nearly a month, that number seems rather daunting. During bowl season, totals higher than 70 have stayed ‘under’ four of the last five games. If any amount of offensive rust shows up in the first quarter of a game with a total over 60, the ‘over’ may never have a chance. It’s impossible to paint the entire bowl season with one brush when it comes to predicting totals. There will be points scored during bowl season and plenty of them, but when it comes down to it, defense will eventually show up too and it is hard to ask offenses to post ridiculous numbers when the trends of a 14-week regular season indicate otherwise. It may be bowl season, but it is still football and coaches know that defense wins championships, even if it’s just a bowl game championship and even if it’s named after a Little Caesar’s pizza or Chick-Fil-A sandwich.